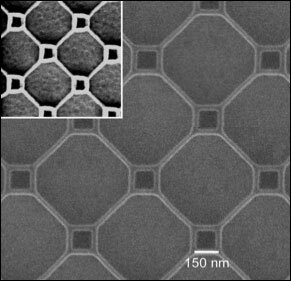 (Nanowerk News) A team of scientists from Bar-Ilan University, Israel, and the U.S. Department of Energy's (DOE) Brookhaven National Laboratory has fabricated thin films patterned with large arrays of nanowires and loops that are superconducting — able to carry electric current with no resistance — when cooled below about 30 kelvin (-243 degrees Celsius). Even more interesting, the scientists showed they could change the material's electrical resistance in an unexpected way by placing the material in an external magnetic field. "Such superconducting nanowires and nano-loops might eventually be useful for new electronic devices — that is the long-term vision," said Brookhaven Lab physicist Ivan Bozovic, who synthesized the superconducting films. "That is the long-term vision."